Yes, it's a 'Constable' badge and yes it's Canadian! True collectors are aware that Canadian badges are extremely rare as most agencies do not wear breast badges in Canada. This full size (3.5 inch tall) oval badge has a custom designed die depicting the City Clock Tower, seal & Canadian Flags. Very colorful cloisonne hard fired enamel is used throughout this beautiful design. This is also a two tone (silver & antique silver) badge and commemorates a "Century of Service" but this badge will remain the standard duty badge of the Hanover Police Service. As always, commitment to quality and design are immediately apparent in this beautifully designed badge currently worn by the Officers of the Hanover, Ontario, Canadian Police. Solid badge with standard safety catch. Certificate of Authenticity hand signed by Chief David Halcovitch. Order now to beat the anticipated rush of Canadian orders. This is the actual original Department Issue duty badge currently worn by officers of the Department. 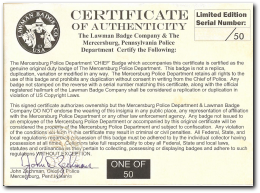 Each badge comes boxed with a hand signed certificate of authenticity from the Chief of Police authorizing the collector to possess their Department badge. No other badge manufacturer offers this rare opportunity to collectors. Lawman Badge Co. guarantees quality and authenticity of every badge. Badges shown are offered in a LIMITED EDITION OF 300. Note: Serial numbers on certificate and reverse of badge assigned according to where order falls within the limited edition (first come first serve). All badges are hallmarked with Lawman Badge Logo on reverse, serial numbered and (as always)...made totally in the USA.